If you just bought yourself a portable cooling system or you plan to, but have no idea on how to install it, this guide is just for you. A portable air conditioning system gives you the desired coolness expected from it without the complexities of a window-based cooling system. It is quite cheap and easy to set up and install due to its compact nature in 10-30 minutes. 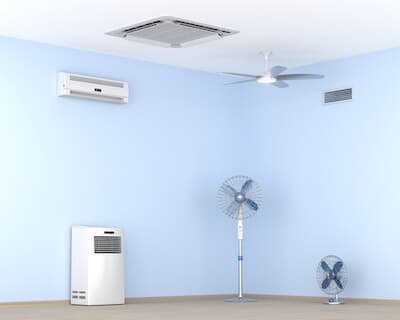 Many people tend to install air conditioners in selected rooms instead of the whole apartment. This is majorly due to financial constraint to afford multiple units or a central unit, not enough space in the house, the weather or the inconvenience of having extra baggage at home. There are times when you might want a particular section of the house without an air conditioner to be cool due to weather or as a result of the number of people at that point in time. In this scenario, a portable air conditioner will be a lifesaver as it is quite affordable and will keep the room cool. Another scenario can be observed during the winter season where windows and doors are always shut. Cooking might be a problem as there is literarily limited air supply; hence the kitchen becomes uncomfortable to stay in for a long time. A portable air conditioning system will suffice again to help in this situation. 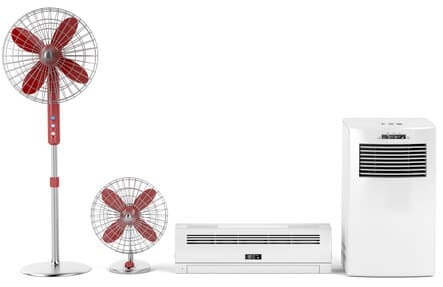 Recommended Article: We cover miniature AC units in our latest article. Air conditioning units work by the principle of making one side cool and the other hot. This hot air needs an outlet or vent to transfer for effective optimization of the portable air conditioner. There are lots of reasons why it is important to vent AC and not leaving it to standing alone in a room working. While it is not advisable not to vent your portable air conditioner, you can still learn how to vent a portable air conditioner without windows present. This may be done in windowless rooms which are attached to older structures where the larger rooms are broken into smaller rooms. Are you ready? Cool. So let’s get started. Firstly, for portable AC installation, you need to place it on a strong base (i.e a hard level surface/floor) 8-12″ away from obstructions. In a room where you have no windows, what do you for an effective portable aircon installation? The goal is to get moist air out of the building for better optimization of the AC unit. In a normal situation, a portable air cooling system would be hooked to the closest window using the plastic hose provided. But that is not feasible as we literarily have no windows. In this situation, there are options once we put on our thinking cap. These options require a bit of modification and minor construction work. In simple terms, a hole will be drilled in an external wall so as to enable the AC vent to be connected aiding the passage of the hot air to the outside. This setup is the simplest as it requires little mental and physical work. It is pleasing to the eyes as the hose can be concealed with the air conditioning system placed in front of the newly created wall vent. Another option is to employ the use of false ceiling space to mount an exhaust duct which travels to an external wall with to serve as an outlet for the hot steam. This option is more complex and requires the services of a professional for the work to be done. If you have a wall-mounted or hearth fireplace with a chimney or a corner fireplace, with a vent leading outside, you can also vent through the chimney if you are not using it. This can be done by passing the hose via the escape hatch. Before embarking on this, ensure there is no soot in the chimney and the flue is open. Whichever option you employ, you are given the means to remove the moist hot air from the cooling system to the external environment. Recommended Reading: We list the quietest portable air conditioners in our guide to the quiet life. A portable cooling system has certain features which makes it versatile, convenient and an ideal cooling system. They tend to have multiple functions besides the major function of cooling the environment. A portable AC like its sibling – the window unit comes with a fan function which when enabled circulates air within that environment. Some units also tend to come with a heating mode which when enabled comes in handy during the winter. You will know this as every cooling system with heat capability comes with a separate BTU rating. Portability is one of the selling points of a portable air conditioner as it can be moved from point A to point B in the home without breaking a sweat due to the units having castors. The fact it is affordable for both the highs and the lows in the society is also a merit, as it can be afforded without leaving a deep hole in your pocket. Recommended Article: Learn all about sliding window AC in our guide to the top models. Another advantage is due to its simplicity, it requires less maintenance when compared to a window or wall mounted air conditioning unit. They are very useful all year round and rarely disappoint as they can make a room more comfortable by dehumidifying it. This they achieve with the aid of a dehumidifier which removes moisture from the surrounding air without cooling. When you press the dehumidifier mode, you have chosen to activate the dehumidifier. One tricky part of the dehumidifier is it requires a drain to remove the moisture the cooling unit collects. A programmable timer: It gives you the power to automate when the AC unit goes off and on. This can help in reducing energy usage/consumption. A remote control: With it, you can adjust the settings of the portable AC to your preference on and off from across the room. A Lamp-off feature: This lets you turn off the display when not in use. The portable air con has its disadvantages, but it’s a really useful option in certain situations. Feel free to drop a comment if you have any question on how to install a portable air conditioner and we will be happy to help. Don’t forget to check us out on Facebook to see more amazing guides!